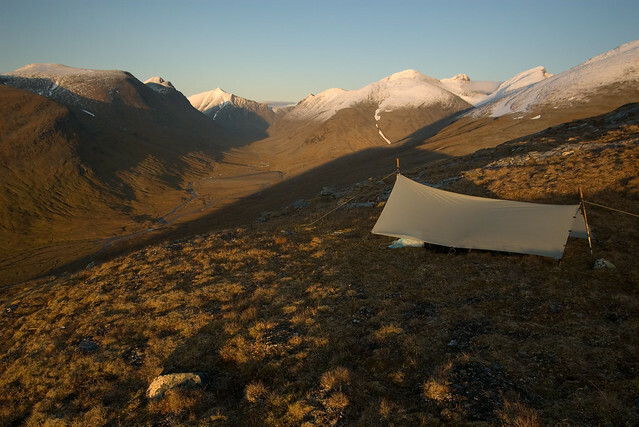 In June 2007 I bought myself a lightweight solo tarp, the Grace solo Spinntex .97 tarp from MLD, which was later on replaced by the Grace solo spinntex EXP (EXP stands for a slightly different spinntex fabric). Today Ron Bell no longer offers the spinntex version what I regret. The years before I started with tarping I had only used a Hilleberg Akto tent. At that time I wasn’t yet hiking lightweight, but the desire to be able to sleep very high in the mountains and why not on top of a rocky mountain summit where it’s impossible to pitch a tent, convinced me to search for an alternative for the Akto. And as I wanted to start going lighter, I decided to try a lightweight combination of a bivy bag and a solo tarp. 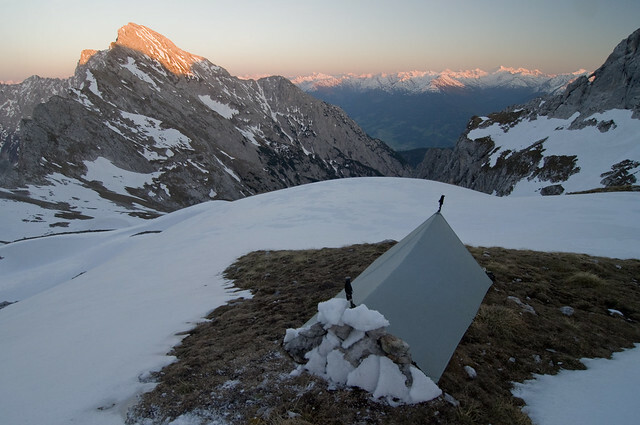 In this system the bivy bag acts as a barrier against the wind and insects and the tarp acts as rain protection and prevents formation of condensation in the bivy bag during sky clear nights. 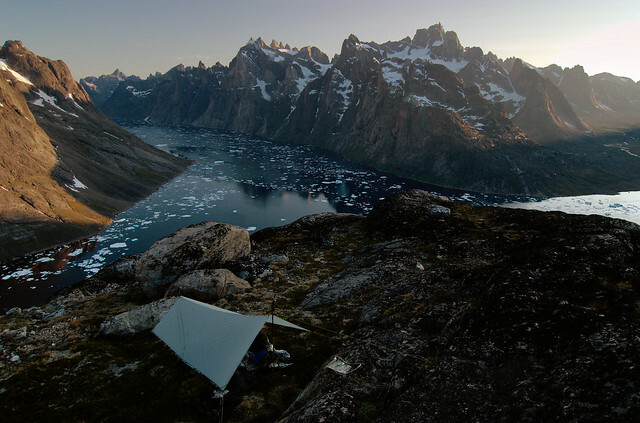 The tarp pitched on the edge of a terrace above Itillersuaq valley in Greenland. On top of the mountain ridge above Aappilattup Avanna fjord. On the rocks in the couloir under a mountain pass in Greenland. Now, four years later and a lot of tarping experience richer, I can ensure you it’s a joy to use such a small and lightweight tarp. The views you get from under the tarp and the possibilities to tarp very high on a mountain in exposed rocky terrain makes it indispensable for me compared to a tent. What I enjoy the most is the ability to admire the sunset and sunrise from the tarp while standing high above a valley or on a mountain. 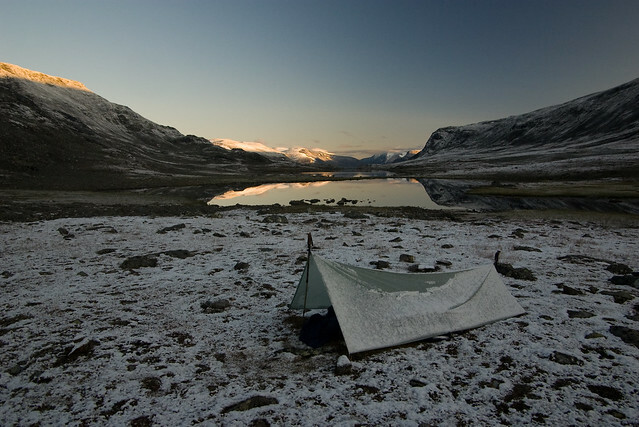 At one night in Sarek I awoke from a slowly approaching reindeer herd grazing nearby in the valley. They didn’t seem to be afraid of my tarp and a few moments later I became surrounded in the middle of the herd. A few reindeer came so close to the tarp eating berries, that I could have touched their heads with my hand if I wanted to, but instead I just remained quietly smiling in my bivy bag watching the animals eating in the dark. Than later on when the herd slowly moved away from the tarp, I suddenly heard a running reindeer approaching. She had separated from the herd and wanted to pass along the tarp. Because she was not able to notice the long guyline extending from the back side of the tarp, she suddenly tripped over the guyline, fell to the ground and let out a cry of fear. Then she got back at her four legs and finally joined the herd. This is one of those hilarious moments I’ll never forget about tarping in the wild. On the summit of Tjågnårisvarasj (1207m) in Sarek with an incredible view in the Sarvesvagge. On Rocher d’Archiane in the Vercors next to the abyss. Sunrise on the summit of Roc de Peyrole (2016m) in the Vercors with Mont Aiguille (2087m), Belledone and Ecrins in the background. But I have to admit, tarping with such a small tarp is not always that fun and comfortable so I think it will not be suitable for everyone. 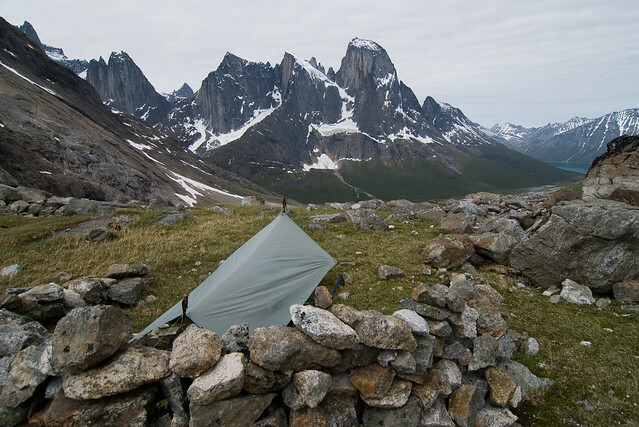 In july 2007 I took the tarp for the very first time on a long trip through Jotunheimen together with an MLD Soul bivy, the bivy bag I usually use with the tarp. The weather was depressing most of the time during that trip because of daily rain. It even did rain non stop for over 24 hours a few times during the trip. I experienced one serious storm with winds estimated to reach 90km/h or even more. 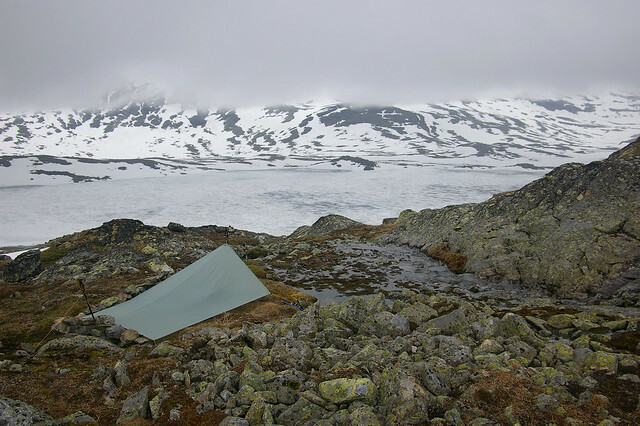 I received the tarp from MLD just a week before the trip, so I didn’t had the opportunity to make a test under wet and windy conditions before heading to Norway. 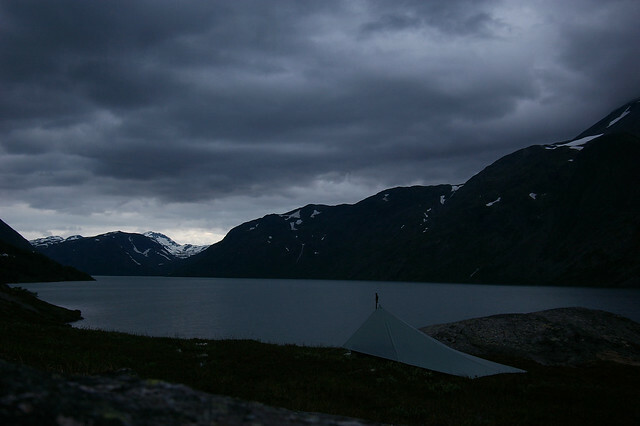 But once on that trip in Jotunheimen, I rapidly learned how to make a bivouac with such a small tarp in extended rain and winds without experiencing any real problems. People would normally choose a tarp with beaks or a shelter for more protection if they will expect rain and wind. But I can tell you, a solo tarp will work as well but will not be as comfortable in every situation though I have to admit. 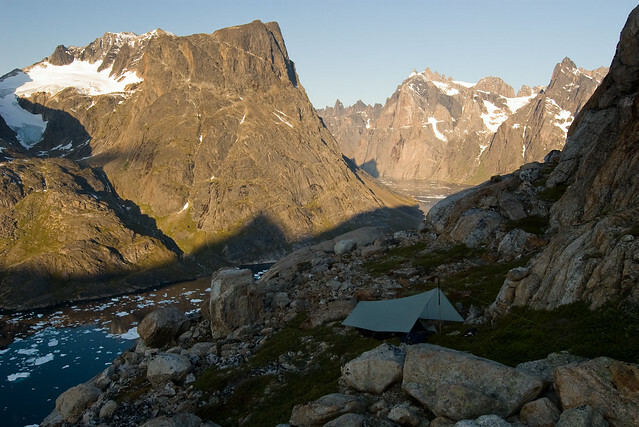 Bivouac along Qooqqup Sermia glacier on Mellem Landet in Greenland. Here I only had a thin and small carpet of moss growing on the rocks to ditch the stakes. 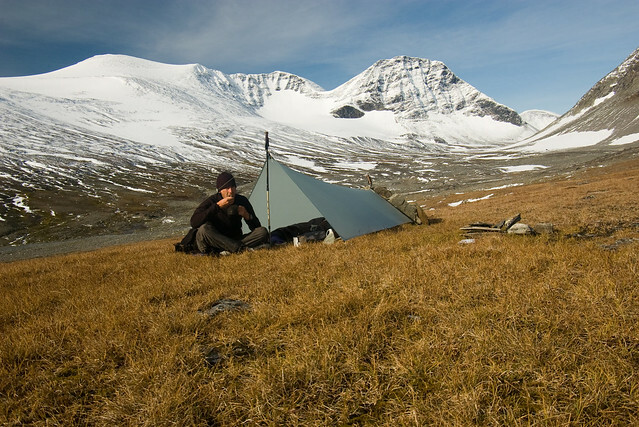 Windy bivouac in Sareks Jiegnavagge. Note the wall of rocks at the back side of the tarp for protection against the wind. The grace tarps are not rectangular but are wider in the front than at the back side. This means you can only pitch the tarp in an A-frame or keep the back side to the ground. I bought the tarp with the back pole option but I’ve never used the tarp with the pole yet and probably never will. In case of rain I keep the sides of the tarp low to the ground. This reduces the risk of rain splash wetting my bivy bag. When there is a lot of wind I often search for some rocks on the ground and build a wall against the back side of the tarp. This acts as a windshield and works pretty well and in case of rain the wall prevents the rain drops from wetting the back of my bivy bag. The drawback is that you’ll have to spend a few minutes to collect rocks and construct the wall. In the Lamskar in the Karwendel while a wall of rocks and snow protects against a cold breeze. On the south slope of Høgbrøthøgde (1821m) in Jotunheimen with view on the frozen Store Mjølkedalsvatnet (1340m). For protection against the rain and wind I’ve pitched the back side rather low and constructed a wall for extra comfort. 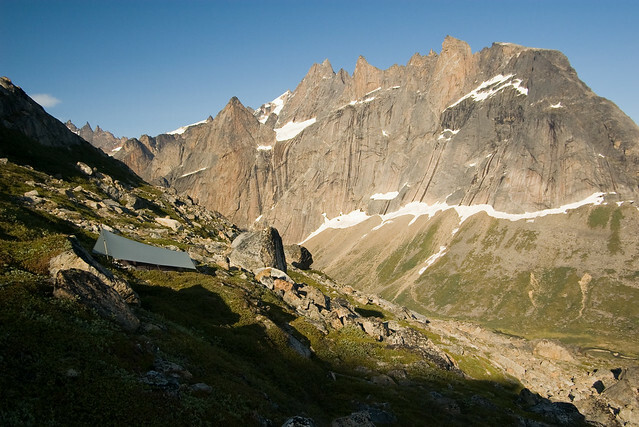 On the col above Klosterdalen in Greenland with the towers of Ketil (2005m) towering above the other side of the valley. A large wall of rocks previously constructed by people can be used to block the wind too. In some areas on the tundra, rocks are absent or you are not able to pull them out. In case of a rainstorm in such a situation, I pitch the back side of the tarp to the ground. The inner space under the tarp is very reduced in this case and you cannot move around under the tarp which is rather inconvenient if you have to change clothes. That’s the negative side. Another option is to search for a rock face or a very large boulder and pitch the tarp in the leeside of the rock in an A-frame. The boulder acts as a wind break and collects the horizontal rain in the storm. This has not always worked well for me though because the boulder really needs to be very large. 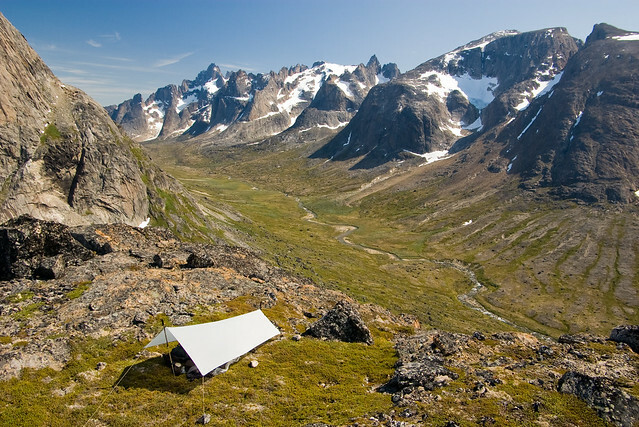 In Jotunheimen I’ve made a bivouac sheltered behind a huge rock once, which protected the tarp perfectly both from wind and rain. The next time I had to search for a large boulder in a rainstorm happened in Sarek and I had a bad experience that time. The boulder was too small, only a few meters wide, and that caused very turbulent winds in the leeside of the boulder. Rain splashed under the tarp and my sleeping bag became a bit moist. In such case you better move the tarp in the wind and pitch the back side to the ground. At lake Gjende (984m) in Jotunheimen. This was my very first night under the Grace solo tarp and because there was a lot of wind and I was not able to construct a wall of stones against the back side of the tarp, I kept the back side against the ground. The really arduous situation where it becomes awkward with such a small tarp is under a heavy rain shower or thunderstorm. Rain splash will inevitably jump under the tarp wetting everything as will be the case with hail stones. 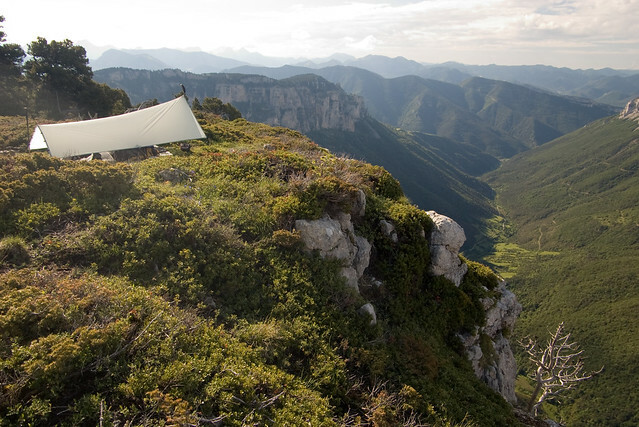 Moreover, thunderstorms in the mountains are often companied with severe wind gusts which can blow from any direction, making it even more difficult to stay dry under the tarp and augmenting the risk of pulling out the stakes blowing the tarp away. Until now, I’ve only experienced one thunderstorm with hail while on a trip with the Grace solo tarp. That was in the Vanoise area in the Frensh Alps. So for a longer summer trip in the mountains at mid latitudes where you cannot rule out the risk of a heavy shower, I wouldn’t trust on such a small tarp anymore unless you want to use a waterproof breathable bivy bag completely made from eVent or similar fabrics or if you have additional beaks to change the tarp into a fully enclosed shelter, this might work too. A shelter like the trailstar or a mid seems better to me than an open tarp in this case. Heavy rain showers rarely occur in the regions around the polar circle on the other hand. So it’s still possible to use a small solo tarp in those areas if you can deal with the afore mentioned minor drawbacks should you experience stormy weather. On the snow in Sarek’s Basstavagge. Here the snow was wet so it was an easy job to pitch the tarp onto a wall of snow to remain sheltered from the freezing wind. 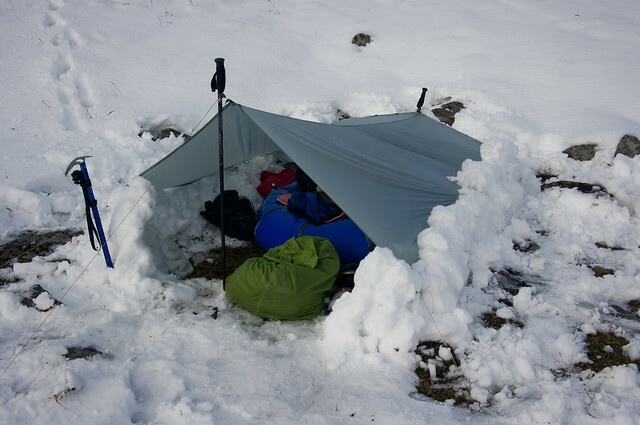 Despite the fact a tarp is only recommended for 3-season use, the Grace solo tarp can handle wet snow pretty well as long as there isn’t too much wind and you’ve pitched the two panels rather steep so most of the snow slides from the shelter by itself. Really dry snowfall like is mostly the case during winter, can be very problematic because the snow might blow under the tarp accumulating against the bivy bag. I’ve experienced a snowstorm once during a late October trip in the Pyrenees and after a few hours I got completely buried under the snow in my bivy bag because of heavy accumulation under the tarp. Below treeline however a tarp might still be comfortable during winter as long as there is no heavy snowfall, though I’ve never tarped in the snow in a forest yet. Cold morning at the lake Snavvajavvre (977m) in Sarek after a night with wintery showers. I chose the spinntex version over silnylon or cuben fibre. Cuben was to expensive for me and silnylon looked a lot heavier. Besides I don’t like the idea of a tarp becoming slack because of the stretching of silnylon when the humidity increases during the night as is mostly the case. Its durability looks acceptable for me till now, even though Spinntex is not as durable as silnylon. If you choose a spinntex version there is one thing you should definitely check before each serious trip and that’s its waterproofness. Under a silnylon tarp or shelter with a weathered coating you will probably experience some misting in case of rain. Spinntex has bigger micropores than silnylon so under spinntex with a weathered coating you will not experience misting but rain! I can speak from experience unfortunately. Fortunately strengthening the coating is not difficult and doesn’t take much time like I’ve described earlier in applying a new silicone coating to the tarp. In Sareks Ruohtesvagge. On that trip the tarp leaked twice in moderate rain because of a weathered coating. I had tape taped on the ridgeline because at that moment I still thought the tarp leaked through its seam. A few nights later however, the reality became clear. If I would have to choose a new tarp today, I wouldn’t choose the Grace solo tarp anymore though. To get a little more protection and a bit more pitching options, I would choose a slightly larger rectangular tarp to be able to pitch like a half pyramid. For long trips with the risk of really inclement weather or thunderstorms, I now use a trailstar instead. 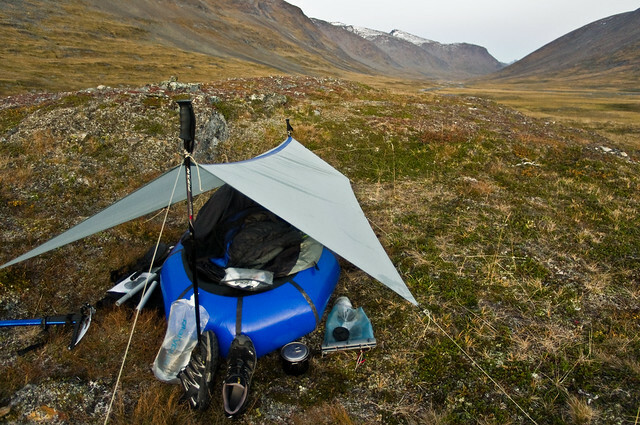 But as long as my Grace solo Spinntex .97 is not worn out, I will still remain sleeping under it as a happy user. 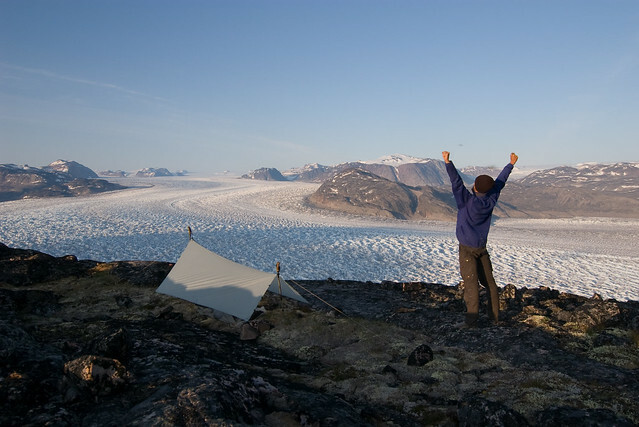 And to end a few more tarping pictures from my Greenland trip. Morning at the edge of the abyss above Aappilattup Avanna. On the mountain slope above Itillersuaq valley. If you are able to find a small place for your body to lie down, it will even become possible to sleep on a slope. On the hill Qalutaassuaq (245m) with the lake Tasersuaq and the surrounding mountain peaks in the distance. This entry was posted in Gear, Lightweight & ultralight hiking, Techniques and tagged Gear review, Grace Solo Spinntex .97. Bookmark the permalink. Manneke lief wat een foto’s! Goed werk! Thanks for the comment! Yes, maybe you should try more often. 🙂 Now seriously, I find the wind is sometimes unpleasant too, especially when it’s cold and wet. I try to cook and eat from within my sleeping bag when it gets too cold. What tarp do you use btw? I have a few tarps … most of the time I use the BPL Spin Tarp, a very small thing similar to the Grace, probably a bit smaller – but then I am too. In Greenland I had the AntiGravityGear and wasn’t too pleased, because it is very unstable in wind. Now it is the Trailstar – will see. Exquisite, Joery. And I concur with Tim above, spectacular photos! Thanks for the kind words Hendrik! 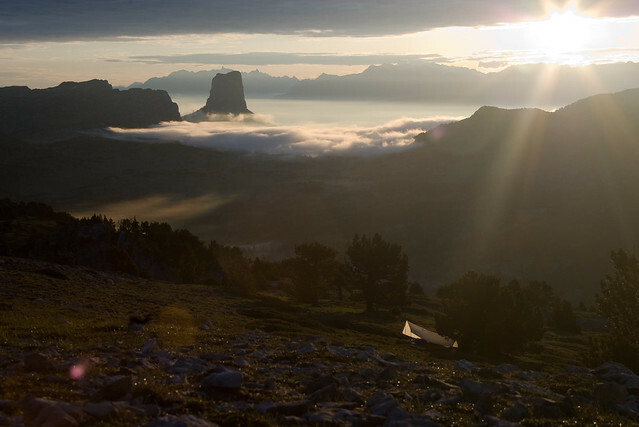 The Sunrise on the summit of Roc de Peyrole in the Vercors photo is simply stunning. The Greenland ones are again spectacular. Might I ask what camera you used? Thanks for the comment. I use a DSLR but wish it wasn’t so heavy. First time reader and first time comment. I found your blog through Hendrik @ Hiking in Finland. Thank you very much for a very comprehensive and Honest review of the tarp, and tarping overall. I’m actually just waiting for some fabrics&accessories to arrive, will try some myog tarp-building. Planning to make a solo tarp, so your reflections was very spot on. Now I’m going to see what you’ve been up to in the past. Good luck with your MYOG project! I’ll try to post more of my past trips in the future. I followed the link from Hiking in Finland. Very glad I did! You relayed your experiences very well and the photos are stunning! I found your views informative. I noticed in one photo (On the rocks in the couloir of a col in Greenland) that you appear to pitched the tarp on very rocky terrain (without pegs?). Could you explain how you achieved this? Good question. I pushed the stakes in the gravel between the rocks wherever possible and placed additional stones on the stakes so they wouldn’t come out. Some stakes were also fixed horizontally behind two rocks. I used my ice axe also this way but then vertically as you can see in the photo. 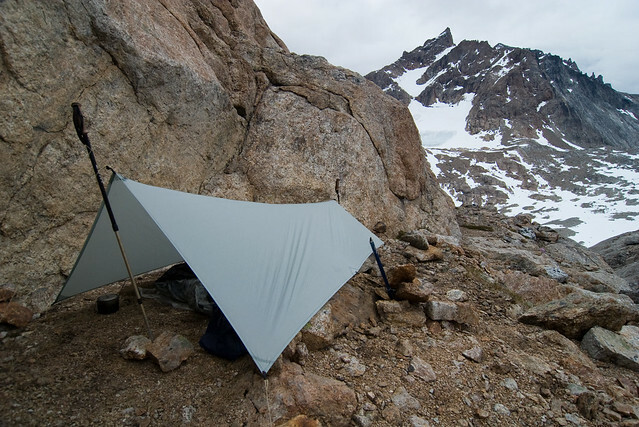 Brilliant account, great insight into your tarp skills, and how the Grace tarp can be a proper tool year round in the mountains when in the hands of a skilled user. Fantastic views! You really know how to use the tarp and make it part of your kit. Thanks for your report. Lovely pictures. You are discussion wind, rain and snow. How about bugs/mosquitos? Yes mosquitos were abundant most of the time on the Greenland trip. I wear a mosquito head net, also under the tarp and try not to worry about them even though they can be annoying sometimes. When sleeping in my bivy bag the mosquito net on the Soul bivy keeps them out. I love tarping in the mountains. On reading your excellent piece I recollect one particular experience in the Norwegian mountains when I battled a troll all through the night. It, ahem.., was a dark and stormy night… and so on. I realize that this might seem like toot toot me own horn, but I would like to say that in this instance I was valiant. valiant and fierce. The battle raged on all through the night. It could have gone both ways but then suddenly my gruesome foe fell by a stroke of the first sunlight. Een vraagje, wat doe je als de wind draait of het opeens echt stormachtig weer wordt? Toch al een paar keer de ingang van onze Trailstar moeten sluiten, anders waaide de regen binnen. Bij het opzetten is het ook altijd de ingang goed positioneren om zowel van de dalwind (avond) en de bergwind (ochtend) geen last te hebben. Hoe doe jij dat? Heb nog maar 3 nachtjes onder de trailstar geslapen, telkens hier in het laagland. Dus ik kan daar nog geen ervaring mee delen. Het voordeel van de trailstar lijkt me dat je van pitch kan veranderen zonder daarbij heel de shelter weer af te moeten breken. Dus bij draaien van de wind zou ik de ingang naar de andere kant verplaatsen of in een vallei eventueel proberen de ingang loodrecht op de as van de vallei te plaatsen? Heb ik inderdaad ook al gedaan. Van ingang veranderd niet. Eigenlijk is het beter om ‘s avonds als te voorzien dat het nodig zal zijn om de ingang toe te maken, want probleem is dat je de toer van de tarp moet doen om het geheel opnieuw strak te krijgen. Absolutely stunning and breathtaking fotos. And what an incredibly beautiful landscape! Amazing! There is no need for a guyline to support the ridgeline of the tarp, but if you like the idea it is not going to hurt if you do it. Have fun with your tarp! 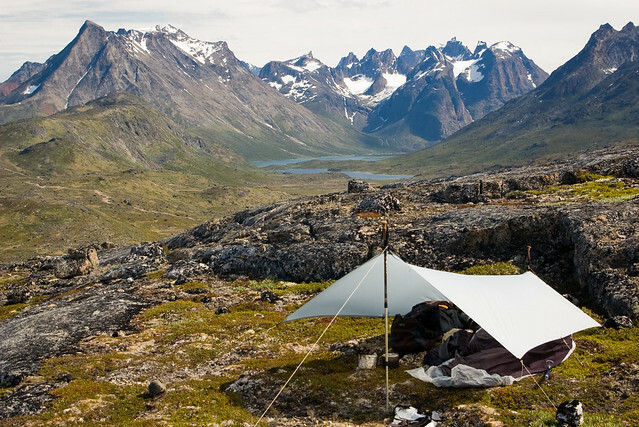 Wonderful photographs and detailed information about your travels with the tarp. The scenery is breathtaking at times and it is great that you have chosen to share these images with us. The Trailstar would certainly look bonny adorning the backdrops you have captured… but hey…the sense of achievement with the Solo Spinntex shines through. Absolutely inspiring.